First of all : Super great presentation and really fun to listen and to watch. Thanks so much for the time as I well know how m8hc work and time is involved in ideas and stdueis like that . Well done . do not look at my question as a critic in what ever you did as a group but the questions are at least for me fundamentally important , because I may have to review 15 +- years of ideas studies and work in combination with NIRS. And NIRS researcher may have to review the ability and feedbacks we may get or not get from NIRS. I like to start veyr small and step by step so perhaps more people can chip in. I had ( sorry my still poor English ) listen 2 - 3 times into certain sections of the presentation and it may simply turn out , that I understood it wrong . 50 m sprint will be anaerobic so there for no or veyr small use of O2 during this effort. 200 m more likely aerobic so need and ability to us ea lot more O2 . 2. IN the discussion of the found results. your group points out, that the result is exactly as predicted. Meaning 50m anaerobic so no O2 use or minimal. 200 m aerobic so lots of O2 use. Now here the one result of a single swimmer overlapped of 4 graphs. Now again I may be wrong but it looks to me SmO2 in the 50 m sprint which is anaerobic drops further done than during the 200 m swim ???? So when we go from this and we look at the summary see below. 50 m is anaerobic and therefor does not use O2 per definition. 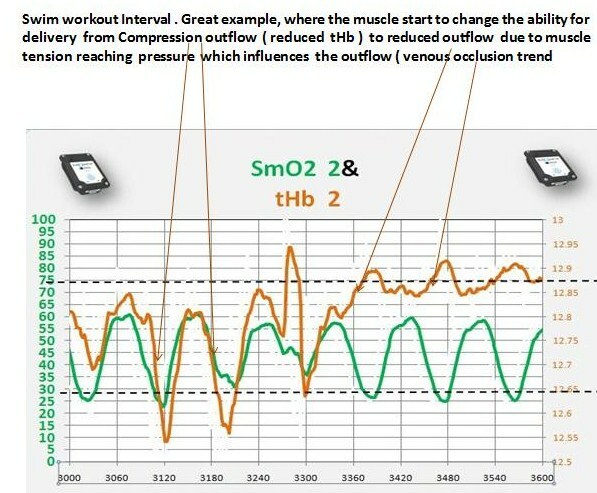 So a lower SmO2 % as shown in the work is an indication of anaerobic no O2 involved workout where as a 200 m aerobic swim will show less drop in SmO2 % indicating a much higher O2 use ??? So a drop in O2Hb which crates a drop in SmO2 and suppose to indicate a use of O2 and an increase in HHb is an indication of anaerobic ??? Based on this we may have to review a lot what I write here on the forum which is okay as long it may be real. Now based on the answer above we have some follow up questions. a) SmO2 is a % of what ? b) Did your group as well looked at tHb as tHb can explain a lot more than the possible idea of "aerobic and anaerobic ?" c) Did your group took after 50 m lactate and after 200 m lactate and if Yes what where the lactate values immediately after 50 m and immediately after 200 m.
For all lactate users what would we expect and why ? This less about beet juice where we can come back later as much more some fundamental difference as you can see how we make SmO2 interpretation and why we look at tHb as well rather than just SmO2. Here one more point SmO2 is simply a % indicator of the O2 loaded on O2 Hb in the total Hb situation. So my question would be, whether it would make as well sense to look at tHb if we look beet juice and potential vasodilatation as tHb is often sued as an indicator of change in blood volume. ? So if you have still the raw csv file from MOXY can you share them with us here by simply sending the csv files ? Again thanks so much for the great webinar but I hope the readers can understand the question, as it indicates exactly the opposite of what we often r try to explain here and therefore no wonder Jiri writes that his colleagues can not understand what I am talking about here. Same would be the case in this webinar, as the university supporting this study clearly ends up with a very different the take and yes I may have to go back and revisit many of my posts therefor the same as this group below here. I like to add some additional ideas to this great webinar and still hope for some discussion and answerers . Below a training done in Montreal by Dominique a world class swim coach with two world class athletes a few years back . She is using MOXY and mounts them on different parts of the swimmer body. Below a small inside view what than can be the answer and how certain ideas of the training may change. UNIVERSITY PARK, Pa. -- Athletes who down beet juice before exercising to increase blood flow and improve performance may be surprised at the results of a recent study conducted at Penn State's Noll Laboratory. While beetroot juice rich in nitrates did not enhance muscle blood flow or vascular dilation during exercise, researchers found that it did "de-stiffen" blood vessels under resting conditions, potentially easing the workload of the heart. Those potential benefits are what prompted David Proctor, professor ofkinesiology and physiology at Penn State, to test the ability of the juice to enhance blood flow to exercising muscles. Now many of the studeis of this university are based on the classical ideas of limitations and VO2 and lactate are dominate in most studies. Now read the next one : Now this group and the two names may sound very familiar as we just had a great summary by Joyner about the fact that there is no such thing like anaerobic and more and Calbet did some major research in the sleeping giant and control of BP due to CO limitation Read and think and have fun. I will be back later oin some interesting studies on vasodilatation substances and why limiter and compensator are a greeat tool to see, whether it at least theoretical could work or due to certain limitations not at all. What do we look for what limiter would not allow any effect on vasodilatation. ? after some more scientifique information above with as usual 2 clear opposite option here some historical points. Going though a typical Swiss humanistique school with Latin and Greek as a base of the education, there was and interestingly enough still is no escape , as looking first back who already did what and how successful. Knowing history may avoid a lot of duplication and repeats of earlier mistakes or missing of some great information. See, again 2 opposite options ? Beet. During my short life span there was already 2 times a beet hype. First time as I was an active athlete getting ready to try out for the 1976 winter Olympic in speed skating. Yes you guessed ,it beet juice was the secret weapon. Than we always have regular some secret ingredient some allowed some less official used . The Selen games , the L arginine games the Ginko biloba games , the creatinine hype and so on. Many of the stdueis you can find have as so often results for or less positive as we see in this short feedback on beet juice. Here some more physiological feedback why again we may see responder and non responder. Remember , when the studies are designed they often take the classical feedbacks like VO2 max. As so often mentioned together with LT 2 this results do not give any feedback on what may have limited a better result. The % of the end result is used on the group which will be tested no matter whether 70 % may be a very different intensity from a physiological point of view. Thee assessment idea we propose with NIRS and or combination of more tools is designed to try to find limiter and compensator rather than an absolute pint for calculation of speculated intensities. 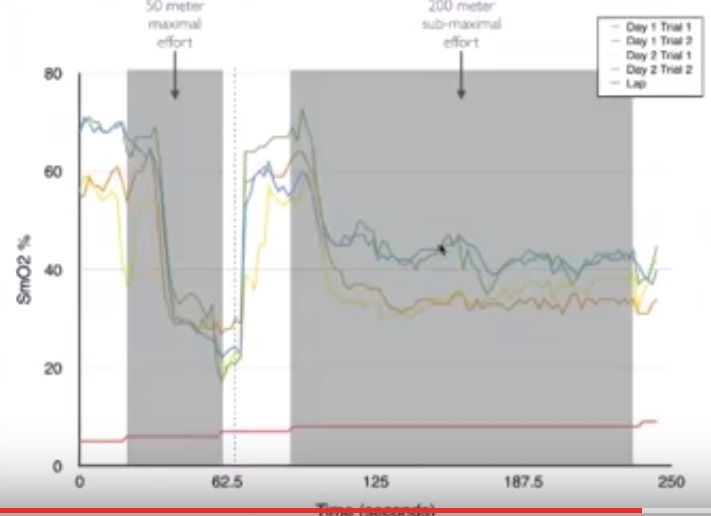 NIRS searches for individual physiological back up intensities and they may as well give some feedback on actual limiters. Now if e look for results like with beet juice e or any vasodilatation agent ( More popular in some testing is Viagra or Sildenafil. 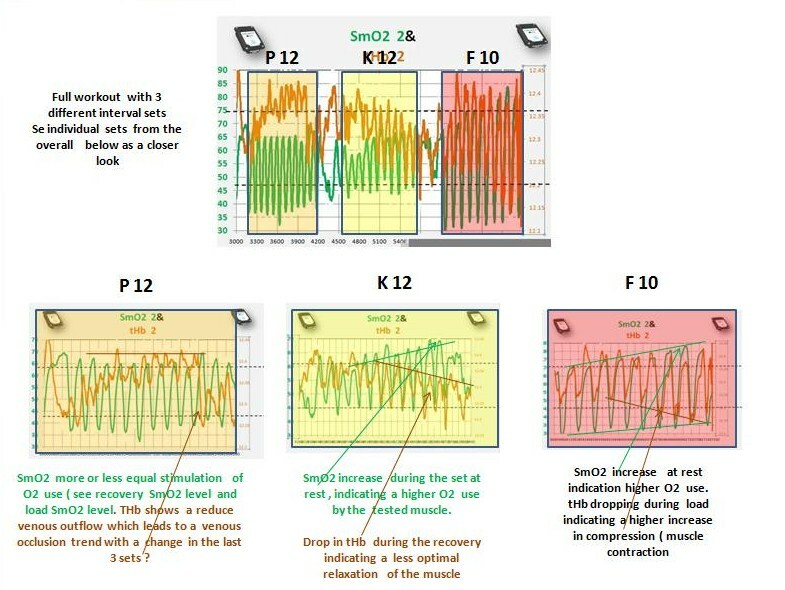 ( some interesting stdueis done from a group in LA in combination with cardiac hemodynamic using the physio flow..
Now most people know the PR of Viagra ( good morning ) and the warning which comes with it that if you have some cardiac problem and you take already some medication which may increase blood flow ( vasodilatation ) and you add another one , Beet juice or in the PR Viagra you may have a sudden drop in BP and some problems ? If you have a cardiac limitation and you try to increase blood flow additional with a vasodilatator and you go veyr hard as mentioned in the work form Calbet an d Joyner, the CG or the lack of Cardiac out put ability will create a vasoconstriction counter balance the vasodilatation effect to maintain BP. If the same people go slower so medium intensity , where cardiac out pout is not reaching its limitation you may see a increase in SmO2 due to increase in vasodilatation. Summary : A cardiac limitation paired with a high intensity may create non responder on beet juice or any vasodilatation ingredients..
Now let's look at muscular limitation. If you have a strength limitation so that your 50 % of maximal strength is easy reached you will create at least a compression problem if not a venous out flow problem. The counter balance would be the heart over CO. Now the increase in CO will create a vasodilatation due to pressure. What will happen if we now create a systemic vasodilatation not over pressure but over relaxation ? Will this help to overrule the muscle contraction force or not ? Now lets assume we have a vascularisation limitation would beet juice or vasodilatator help? 2 option as a limitation . Dempsey's explain metabo rreflex reflex. Beet juice good or bad ? Lets look actual respiratory limitation due to a limited VE. At high intensity this limitation can create a EIAH or a low SpO2 due to a high cO2 level ( hypercapnia ) High CO2 is a potent vasodilatator in the systemic system. So you add beet juice . ????? You may create anew limiter and who would that be ? To end up this fun section here some more feedback form the past. Originally and still today you use the leafs form the beets as well as the root. The leaves where veyr early used and taste close to Swiss chard. The old Greeks ( see ) and the Romans actually used this for their food. The actual roots where much later cultivated and possible in Italy but some argue more in Germany we look at early 15oo. Around 1747 Andreas Sigismund Marggraf a german chemist was able to extract sugar from beets. One of his students Franz Achard than was even more successful and extracted much more efficient sugar and now the world open up for many new ideas including beer and molasses, which in Europe is still produced. With this a whole industry of sugar production exploded in Europe Germany Switzerland and so on. About 15 - 20 % of todays sugar in the world comes from sugar beets. The interesting advantage is that beet sugar production needs much less water 3 - 5 times less than sugar cane so it opens sugar production in countries like Egypt or other with some water limitation. Going back to the Greeks an Romans. Beet was their Viagra and in many stories this show s up like in the famous city of Pompeii in they red light shops. The famous Aphrodite, the goddess of love, was eating beets, ( which really did not made too much sense but still history tells us that she tried to enhance her sexual life .. Much later researcher found a possible explanation of this stories by analyzing beet roots. It contains different substances like boron , or betaine and the famous tryptophan all suppose to make you feel good and enhance ( mainly Boron ) the amount of sexual hormones. So really in any case if you can not bike faster you still may feel better. So nothing to loose enjoy as I will have a lot of beets in the fall out of my garden. Is this webinar available for viewing? Why should people who take nitrates due to cardiac problems not take Viagra or if they take it what could happen. Same question to beet juice. So follow up question we discussed . What is in this people the limiter.? We have in eays term 2 groups where vasodilatation may not eb a good idea to push for. In this review we integrate ideas about regional and systemic circulatory capacities and the balance between skeletal muscle blood flow and cardiac output during heavy exercise in humans. In the first part of the review we discuss issues related to the pumping capacity of the heart and the vasodilator capacity of skeletal muscle. The issue is that skeletal muscle has a vast capacity to vasodilate during exercise [approximately 300 mL (100 g)(-1) min(-1)], but the pumping capacity of the human heart is limited to 20-25 L min(-1) in untrained subjects and approximately 35 L min(-1) in elite endurance athletes. This means that when more than 7-10 kg of muscle is active during heavy exercise, perfusion of the contracting muscles must be limited or mean arterial pressure will fall. In the second part of the review we emphasize that there is an interplay between sympathetic vasoconstriction and metabolic vasodilation that limits blood flow to contracting muscles to maintain mean arterial pressure. Vasoconstriction in larger vessels continues while constriction in smaller vessels is blunted permitting total muscle blood flow to be limited but distributed more optimally. 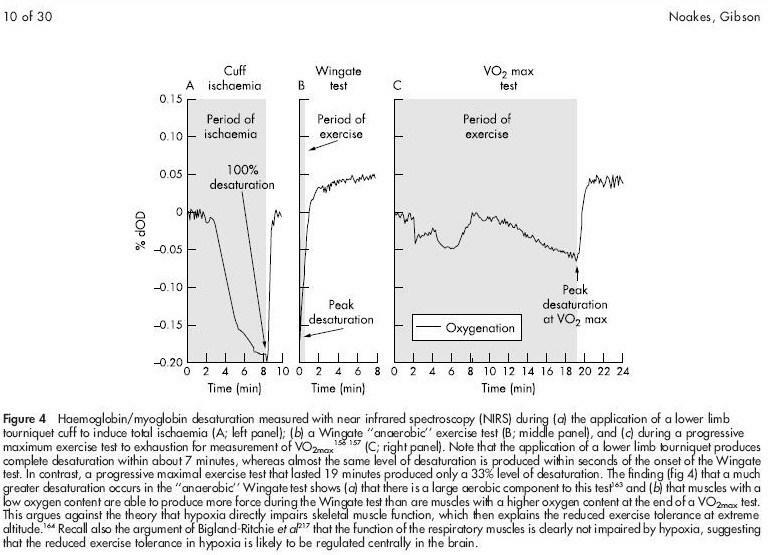 This interplay between sympathetic constriction and metabolic dilation during heavy whole-body exercise is likely responsible for the very high levels of oxygen extraction seen in contracting skeletal muscle. It also explains why infusing vasodilators in the contracting muscles does not increase oxygen uptake in the muscle. Finally, when approximately 80% of cardiac output is directed towards contracting skeletal muscle modest vasoconstriction in the active muscles can evoke marked changes in arterial pressure. Continuous dose of nitroglycerin increases severity of heart attacks, study shows ?? ?